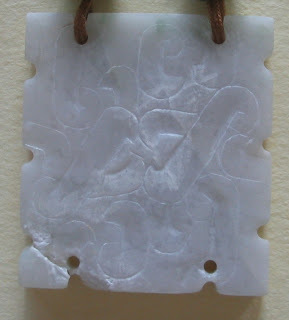 This flat white jade square with 4 holes was purchased on one of my China trips. This piece may have formed part of a jade belt or it could be a Pei. 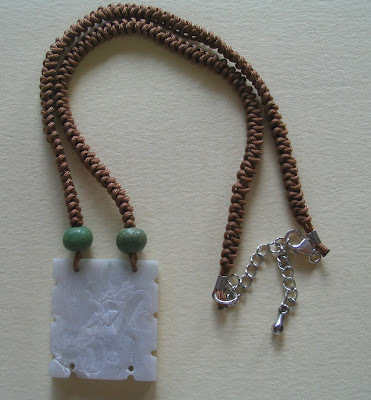 A jade pei is a pendant used in ancient times as a decorative ornament , stitched with silk threads to other items to form a belt or chateline. The color is greyish white with low relief carving showing a pattern of interlocking long "S" scrolls and short "C" scrolls and the same pattern is repeated on both sides. There are small patches of white calcification on the surface and this whitening appears on both sides which maybe evidence of antiquity.These aging marks make me optimistic(though not postive) that my jade square may at least be Ming if not Han. Using snake knots and Pyu green glass beads, I converted this last ramnant of an ancient jade belt or pei into a unique pendant necklace with a long history. Copyright © Daffydil Tan. All rights reserved. 2 years into my blog and I think its time to make some changes. I intend to expand the scope of this blog as just focusing on jade and beads is too narrow. Anway as more and more of my posts seem to be spilling over to border line topics, I may as well sweep in other antiquities and related activities to pad up the blog and make it less stodgy. But if you are a jade, bead or antiquities lover , Welcome !